We are not a church or represent any one particular organization. If your fellowship / congregation would like to be a part of our Festival planning team—please contact any one of us! We look forward to having your fellowship cosponsor and/or participate in this stimulating, spiritual, insightful, musical, and fellowship-filled Tabernacle’s journey with the love that true disciples must have for each other! The Festival is made possible by all the members of the Body working together–not just one person or several—to bear the fruit and gifts of the Holy Spirit / Ruach Ha’Kodesh ! 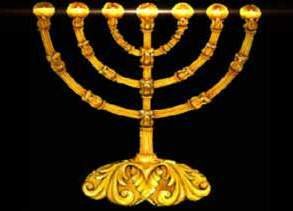 The ancient Menorah hearkens back to the Temple, continues onto the present day, and into the future where the candlesticks of Revelation are mentioned.